Take a trip to Hawaii in a can! That's what I decided to do on a nice long 3-day weekend in the midst of January in Colorado. A dark beer on a cold day was just the thing I was looking for when I spied a nice porter from the Aloha state. This beer review took me back to some familiar waters, so to speak, in the form of an old favorite - Maui Brewing Company's CoCoNut Porter. I had first tried this brew several years ago at a Great American Beer Festival in Denver. Ever since Maui Brewing took gold at the 2006 World Beer Cup, this brew has been a welcomed sample here in Colorado. I've had this brew in two forms, the first on tap in it's standard format, and also as a wood-aged brew that was stored in a rum barrel. However, I had yet to taste an entire glass of it and give it a review. The time had finally come. Maui CoCoNut Porter is classified as a Robust Porter made with 6 varieties of malted barley, hops and hand-toasted coconut. It weighs in at 6% ABV and came in a 4-pack, all for about $10.99. Would it be as good as I remember? Would it remind me of my trip to Maui 15 years ago? Let's find out. Appearance: Right out of the can this robust porter was begging to get out. I popped the top of the can and a nice light brown foam started to peak out. As it poured into my glass a large 3-finger+ tightly packed foam rose and seemed to want to grow further. It took a long time for that head to settle too. The beer itself was very dark brown and had some nice mahogany edges around the snifter glass. Aroma: Ah yes, this brew was full of a rich smell of roasted malts, some chocolate, some coffee qualities along with a distinguishable coconut blend. It was a highly inviting aroma to be sure, just as I remembered it. 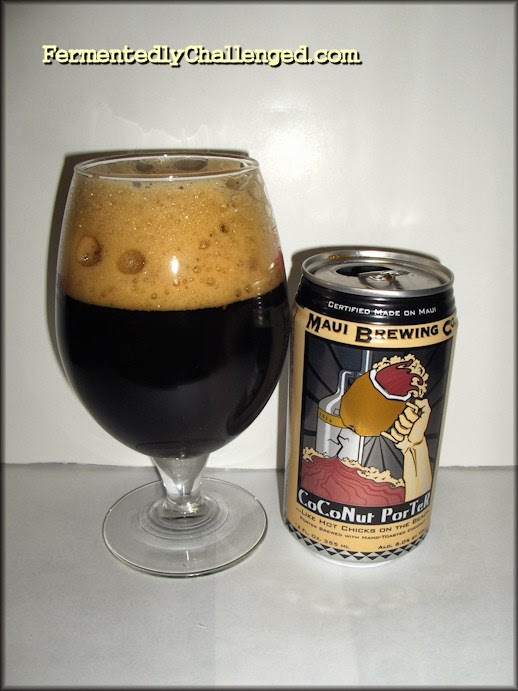 Taste: Maui Coconut Porter had a full bodied feel filled with rich dark roasts with a touch of sweetness and enough coconut that reminded me of a Mounds bar. There was hints of bitter coffee roast there too. Altogether, the coconut, dark malts, caramel malts and the hops mixed extremely well. It seemed like no time that I finished this 12oz beer off. It was as good as I remembered, even from a can! Overall: What would make this beer even better? I tried pairing this beer with something sweet. 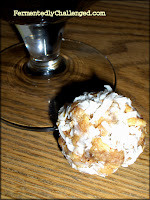 I just happened to have some coconut cookie balls left over from a dinner and tried one along with this coconut brew. Perfect! The sweet cookie ball countered the roasted bitterness and the two variations of coconut mixed well together. Maui CoCoNut Porter seemed like a nice after meal drink. It would probably work well as an après-ski drink also. There's plenty there that warmed me up on this cold day. It was one of the best porters I've had in a long time. It still seemed to maintain it's gold medal quality. This brew is readily available across Colorado. Good thing too, this winter is going to drag on for a while and I'll want more of this. - Ska Brewing Ten Pin Porter review.